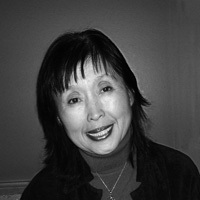 Yumiko Tsumura earned an MFA in poetry and translations from the University of Iowa Writers workshop. Her poems have appeared in chapbooks and numerous poetry journals. She has complied a book of her poems, Woman of March. Her recent books of poetry translations, in collaboration with Samuel Grolmes, include Kazuko Shiraishi’s Let Those Who Appear (2002) and My Floating Mother, City (2009) by New Directions and Tamura Ryuichi Poems 1946 -1998 (2000) by CCC Books. In 2010 Manoa published her translation of Kazuko Shirashi’s long essay “from Landscape of Poetry, Portraits of the Poets, Ryuchi Tamura.” In 2014 New Direction will publish her translation of Shiraishi’s recent poems Sea, Land, Shadow. She is currently working on a translation of the novel Floating Bridge of Dreams by Yumiko Kurahashi. She lives in Palo Alto, California.